Postcard US-1864022 to California shows a field survey photo I took at Banda Aceh, Indonesia during the aftermath of the 2005 Indian Ocean Earthquake and Tsunami. The earthquakes damaged city's water supply and sewerage systems. Drinking water had to be trucked in and supplies were often in shortage. 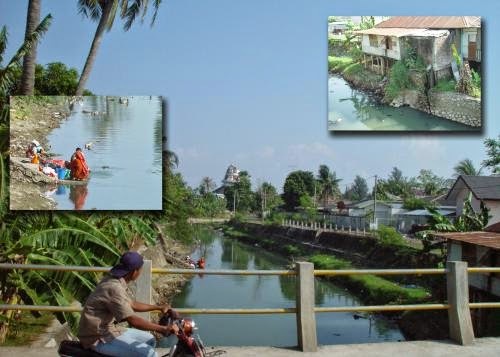 Residents had often resorted to nature water bodies for their needs, as shown in the inserted photo on the left where the woman dressed in red was doing her laundry downstream of the river. Meanwhile, as seen in the enlarged photo on the top right showing the house upstream by the right side of the bridge, raw sewage had been discharging into the river directly. Providing clean, safe and sanitary water has been a challenge for many parts of the world, especially after natural or man-made disasters. 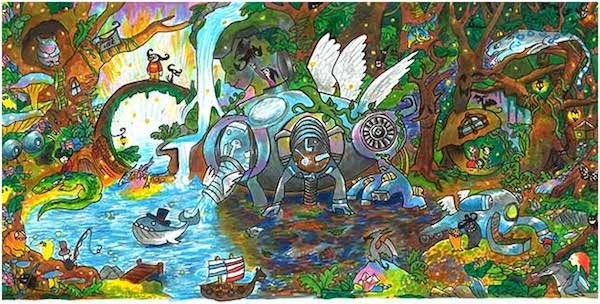 I was ecstatic to see that 11-year-old Audrey Zhang, a student from Island Trees Middle School in Levittown, New York, won first place in Google's annual Doodle 4 Google competition by drawing of a transformative water purifier machine to make the world a better place. As Zhang describes her machine, "It takes in dirty and polluted water from rivers, lakes, and even oceans, then massively transforms the water into clean, safe and sanitary water, when humans and animals drink this water, they will live a healthier life." Her artwork was displayed on Google's search page on Monday, seen by millions of people.